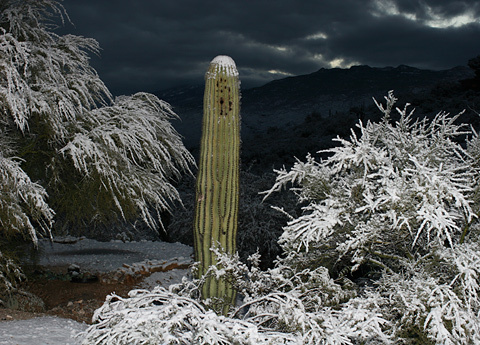 Although the higher elevation mountains around Tucson get snow every winter, Tucson itself will go for many years without any recorded snowfall. 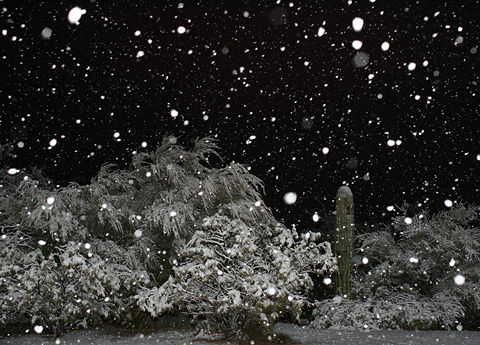 So when snow began falling here in Tucson on the evening of January 21, 2007, it was definitely an unusual and camera-worthy event. The snowflakes were large as if a number of flakes had clumped together, and it didn't take long for them to accumulate. I ended up with about 1.5 inches (3.8 cm) of snow at my house here, which for Tucson is a major snowfall amount. Snow in the desert can be treacherous because its soft, mounding whiteness can hide all sorts of wickedly spiny desert plants just waiting to be blundered into. Luckily, this snowfall was light enough so that cacti and other nasties could still be clearly seen and avoided. 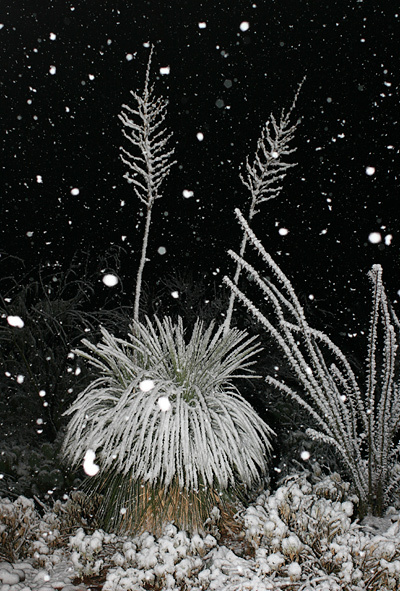 Even though the snowfall was relatively light, the snow was wet and very sticky, and it heavily frosted our desert plants with white. The clump of Soaptree Yuccas (Yucca elata) above looks a bit like a shaggy, white head with two antennae (dead flower stalks). To the right is an Ocotillo (Fouquieria splendens). 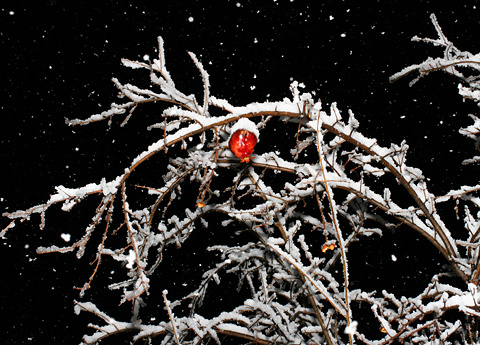 Snow also covered the plants in my garden, and although many are drably dormant or looking quite pitifully damaged from the unusually cold weather, some like this Pomegranate (Punica granatum) looked quite beautiful in the snow. The reason that this red Pomegranate has lasted throughout the winter is that it's just a hollow, dry shell, excavated by hungry birds and then home to annoying Paper Wasps (Polistes spp.) that are only around when the weather is much warmer. As the gray light of dawn backlit the Rincon Mountains east of Tucson the next day, the desert and its plants like this Saguaro (Carnegiea gigantea) cactus and these Yellow Paloverde (Parkinsonia microphylla) trees remained covered in snow. The sun emerged later that morning and quickly melted our rare snowfall away, but I did manage to get some daylight Tucson snow photos.